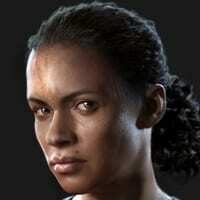 This article contains the Character Page for Nadine Ross in Uncharted: The Lost Legacy. Former leader of the private military company, the Paramilitary Organization (PMC) Shoreline, and served as a mercenary in South Africa. She inherited the position of managing the Shoreline from her father who passed away. Nadine Ross departed for the pirate colony of Libertalia with the permission of the businessman and treasure hunter Rafe Adler. She pairs with Chloe Frazer in their search for the Tusk of Ganesha, an artifact caught in the middle of the civil war in India. After the previous incident, she began to work independently due to the misfortunes that came about with Rafe. As a result, she became cold towards mercenaries. Known for her no-nonsense attitude, Nadine Ross is able to command an army of men. Through years of experience of being exposed to the war, Nadine toughened up to withstand various confrontations. Even in the face of two hostile towering enemies, she remains a formidable opponent. A sensible, and risk averse woman, Nadine ensures that she gets the job done. She fosters camaraderie alongside her allies. However, she can get impatient and will demand results. Despite her weakness, she cares deeply for her comrades, and will not risk losing them in the face of sailing uncharted waters.